Perfect power supply for the travelling musician, or those beachside jams/busking slots with a battery-powered amp. Works! Compact, discreet and easily mountable. Pedaltrain seems to have the market sewn up when it comes to its pedalboards, so producing power supplies for the pedals you put on 'em is pretty sensible. Alongside the existing and hefty Powertrain 1250 supply comes the new Volto, and it's not your usual power supply. "It's ideal for the travelling/busking musician or indeed any of us who need an ultra-quick set-up time"
It's USB rechargeable, which means, once charged, your pedalboard will be mains-free: ideal for the travelling/busking musician or indeed any of us who need an ultra-quick set-up time; at an open-mic slot, for example. Slightly wider than an original iPod, it takes six hours to charge from zero to full capacity via the supplied USA cable and mains plug with USA, European, Australian and UK adaptors included. There are two (non- isolated) 9-volt outlets - it's only designed to power 9-volt pedals - and included are two single-use right-angle plug pedal leads, and two three-connector daisy-chain right- angle plug cables. With a total of 2000mA, Volta could in theory power a lot of 9-volt centre-negative Boss-style pedals (it will work with centre- positive pedals, although you'll need an adaptor lead, not supplied) but bear in mind the more you power, the less time you have per charge. 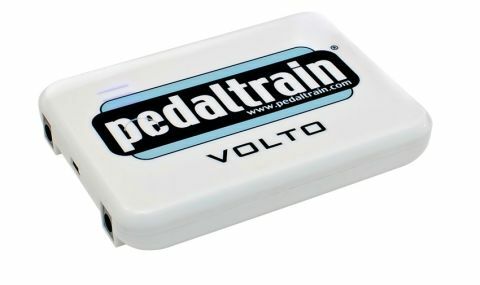 According to Pedaltrain, one to five pedals will give you about 36 hours use; while six to 10 pedals will provide 18 hours use. Plenty for long rehearsals and gigs. Compact, discreet and easily mountable on your Pedaltrain or other pedalboards (Velcro strips supplied) or simply a compact power supply for those who need to get mains-free power to any pedals.